I saw this classic Hot Rod on Chop & Roll magazine few months ago and I was stricken by the uncommon colour (PPG 1936 Cordoba Tan) and by the smooth design of this Deuce. Plus its story was really cool: built in California and shipped to Japan where its new owner lives. 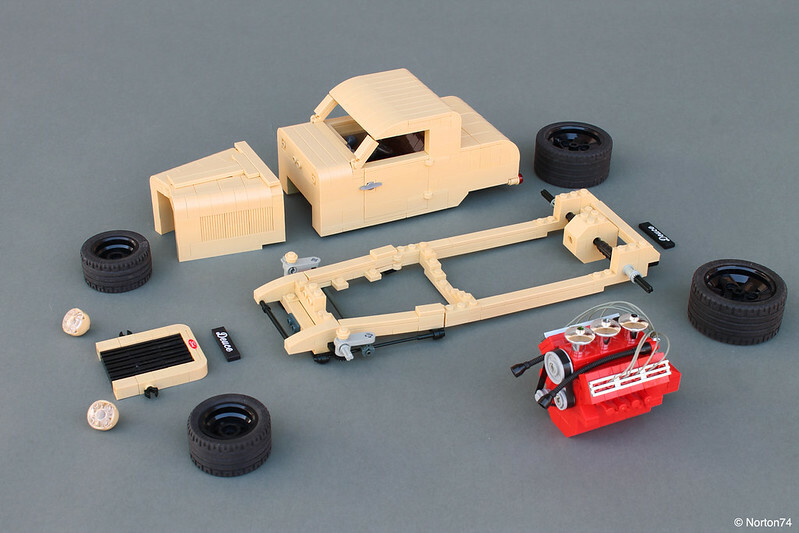 Japan has a thriving hot rod scene, and many cars have been bought and shipped there. This coupe, however, is the first being built to order then making the trek across the Pacific. 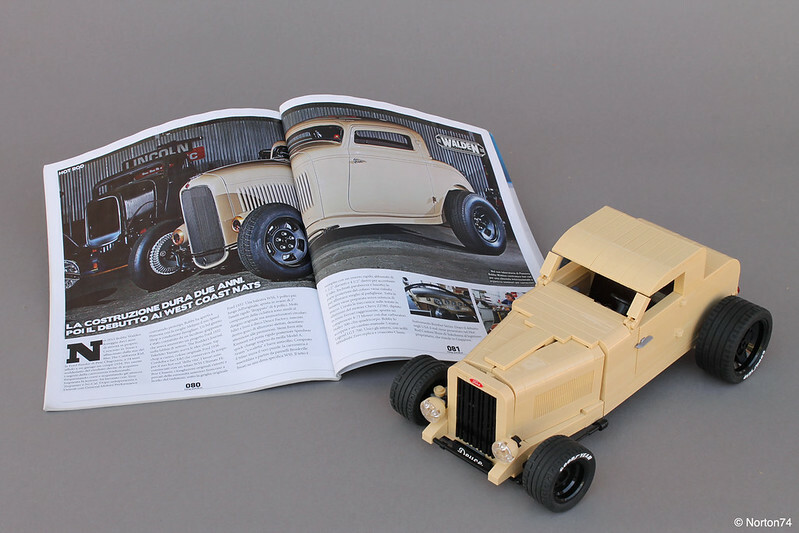 Takehito Yamato contacted Walden Speed Shop, based in Pomona Ca., after seeing his works in The Rodder’s Journal. 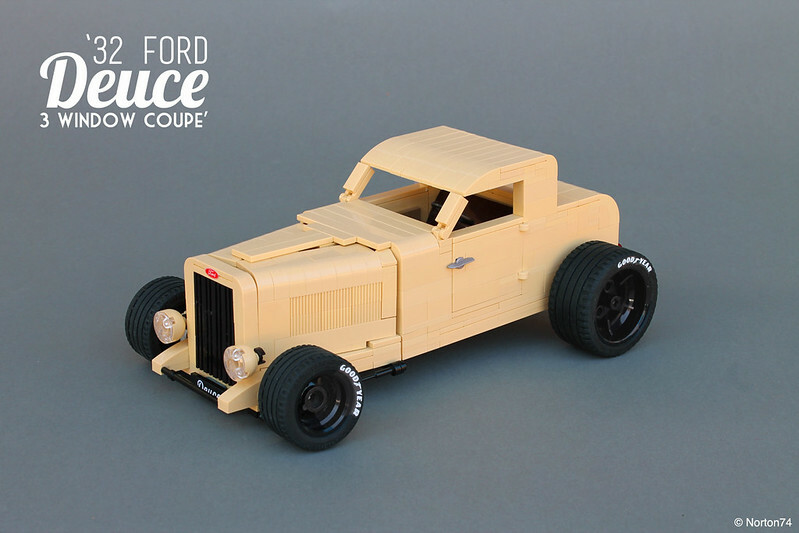 Takehito wanted a traditional hot rod, and while that may be essentially what he ended up with, the details are what really sets this coupe apart. Inspired by the Takehito Yamato history I built the tan Deuce with all the details you’d expect to see in a brick-built scale model. To complete the work I built a brand-new show-room full of vintage stuff. Below the broken-down view showing the red Chevy ZZ383 with aluminium heads in all its glory. Below the Deuce with the magazine where I read about its story. I love the cleannes design of your build Andrea. Beautiful car, the simple, clean lines look great! 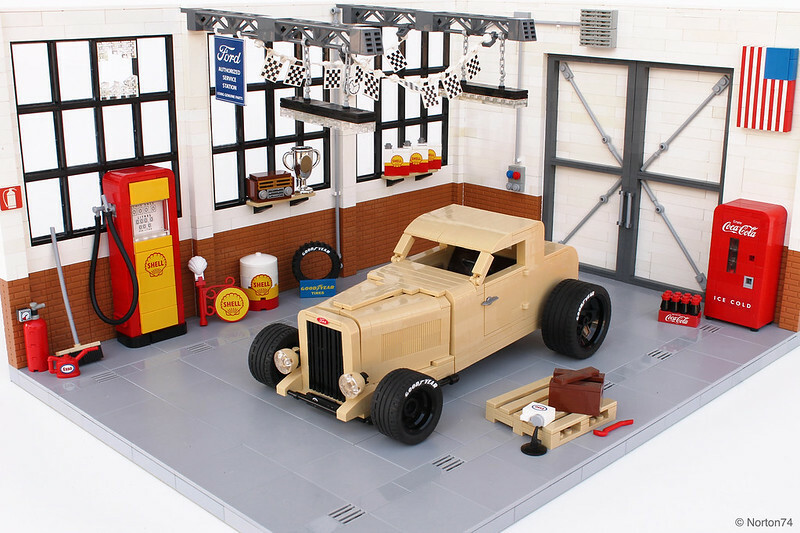 I also like the display garage, wonderful setting for it! I am amazed by how the engine fits into the car. It looks great and really detailed! Why don't they sell sets like this? Thank you @Leonardo da Bricki, very kind! Thanks @Capparezza, your nickname sounds italian, isn't it? I don't know @Mechbuilds, thanks for stopping by! Yes indeed, even though it's not correctly spelled I'm living quite near the Italian border, so I'm heavily influenced by Italian Food, Lifestyle and cars of course. Driving an Alfa Romeo 159, had 2 156 in the past. Maybe you can do an Italian classic car next time? The detail and the efficiency of your builds never ceases to amaze me! Thanks a lot for your kind words and Merry Christmas! Season's Greeting to you too @Norton74. I look forward to seeing what you create in 2018.